Agricultural biodiversity plays a huge role in maintaining resilient local economies, balanced diets and balanced ecosystems. The rapid disappearance of agricultural biodiversity and the lack of measures to protect it are therefore great causes of concern. Mainstream agricultural policies, which generally promote monoculture agriculture, Genetically Modified Organisms (GMOs) and Intellectual Property Rights threaten such agricultural biodiversity, having an impact on agricultural landscapes, species, varieties, breeds, the wild relatives of crops and livestock, pollinators, micro-organisms and genes. These policies and practices lead to the disappearance of plant and animal species, and the knowledge embedded in their management and use. The good news is that in recent years many promising initiatives have been launched around the world that aim to preserve and manage agricultural biodiversity. Small-scale family farmers often play a central role in these, acting as custodians of biodiversity. But other actors and institutions also play important roles. Producers, public and private institutions and consumers are reconnecting with each other through innovative market arrangements, many of them at local or regional level. Farmers and researchers are taking up joint research initiatives, and farmers’ organisations are engaging in dialogues with policymakers, pushing for policies that enhance agrobiodiversity. Issue 30.1 of Farming Matters will look at these emerging initiatives and at the insights gained from the efforts to up-scale these experiences. We particularly aim to explore the factors that help breaking the glasshouse that is preventing the expansion and mainstreaming of such ideas and practices. The topics we will look at will include the revitalisation of local seed systems and indigenous livestock breeds at a large scale; the market mechanisms and policies that support agrobiodiversity; farmers’ innovations and the role of knowledge and information networks. As 2014 will be the International Year of Family Farming this edition will also explore the close interconnection between agricultural biodiversity and family farming. The South Asian Network for Development and Environmental Economics (SANDEE) is organizing a three-day course designed for researchers who want to strengthen their skills in conducting cost-benefit analysis to analyze environmental issues in Gokarna Forest Resort, Kathmandu, Nepal from 6th Dec. 2013 – 8th Dec. 2013. 2. Discounting future benefits and costs. Choice of discount rates. Social discount rate. Class sessions combine lectures, discussion, class exercises, presentations, and interactive work. A high level of participation is essential for successful completion of this course. The workshop is open to SANDEE researchers from countries in South Asia and will be held at Gokarna Forest Resort in Kathmandu, Nepal. It will be fully residential and organizers will provide accommodation and meals for the duration of the workshop, necessary course materials and reasonable travel claims on the basis of actual expenses to the participants. While SANDEE researchers will be fully funded, we have a few seats available for sponsored participants. Such participants will be required to cover their own travel and pay a course fee of $600, which will cover boarding, lodging (twin-share basis) and tuition. Please apply with a short CV [no more than two pages], a cover letter clearly expressing the reason for your interest, and a one page description of a research program or project (on-going or planned) that you are interested in within the field of environment and development economics that requires cost-benefit analyses. Please send this information to application@sandeeonline.org by 25th Sept. 2013. Youth, defined in Nepal’s National Youth Policy as those aged 16-40, make up 39 percent of total population, and 38.8 percent of them are either unemployed or underemployed. These young people are not necessarily idle, but report themselves as “unemployed” because they are waiting for what they consider “appropriate” jobs while they are engaged in odd jobs. This not only shows how badly human potential is wasted, but also highlights the irrationality in the economic and political structures that we live in. Globally, organizations like ILO, UN Millennium Development Goal, etc. have raised the issue of youth unemployment, but neither these institutions, nor other development agencies and national governments have any idea how to generate decent and productive work for youth on the required scale. Youth are the key part of a country’s national, socio-economic and political life. Youth engagement in developmental work is meant to empower young people to play an assertive and constructive role. In recent times, the information and communication technology (ICT) sector is booming propelled by the rapidly growing usage of mobile phone and internet services. In recent years, there have been improvements in agricultural infrastructures in Nepal. Nepal has achieved a 24.51 percent internet penetration, according to the latest figures released by the Nepal Telecommunications Authority (NTA). Around 90 percent of the country’s data customers are mobile GPRS users. Mobile phones are helping in agriculture and rural development by providing information to farmers about market demand and supply, about market opportunities and much more. One of the biggest advantages being technology adopter means we can replicate successful development models. Similarly our generation can help introduce new technologies whilst also learning from traditional methods, holding the potential to offer the perfect fusion of new and traditional solutions to some of the biggest challenges. Several global organizations like World Bank, e-agriculture, CTA etc. are working on ICTs to innovation and entrepreneurship support, designing new tools to help start-ups drive growth, tackle development challenges from several years. Technological progress is a considerable driving force behind economic growth. ICT infrastructure in particular has attracted much investment, and generated significant fiscal revenues and employment opportunities in developing countries. In this regards, Agribusiness Innovation Center (AIC) model is a successful model of global leading organizations in countries like Tanzania, Senegal, etc. and now under practice in Nepal. Agribusiness development comprises supporting a number of components including Small and Medium Enterprises incubation, and value-chain development through support to farms (of varying sizes) and large-scale investments. It seeks to test a variety of models for providing pioneering agro-processing entrepreneurs with a holistic financial and nonfinancial service offering that enables innovation and facilitates access to markets, and thus accelerates the growth of the enterprises. It’s a one-stop shop where a range of service offerings are provided to new, budding and established entrepreneurs. Entrepreneurs are able to access training, mentoring and coaching services, facilities, market research and linkages, financing and government, industry and donor networks. infoDev is now aiming to make the AIC a reality for Nepal. Agricultural professionals are more and more concerned with the potential uses of ICT for rural development, while these tools also continue to be popular among young people and it can also help deter young people away from stereotypes of traditional farming and help change their perceptions on agriculture by helping them to view it as an exciting and innovative industry. To conclude, ICTs have a great role to play in agricultural development, food security and rural development. ICTs will allow farmers to show with globalization (E-trade, e-selling, e-learning, e-education). To achieve these goals, youth have to be implicated because there are those concerned by economic growth, social security and political stability, because youth represents more than 60% of handwork in all sector notably agriculture, more than 80% are students, and they are those who will lead the world tomorrow and ICTs is an essential key. Focusing on the youth therefore, in programs that stimulate sustainable agricultural development, is necessary. 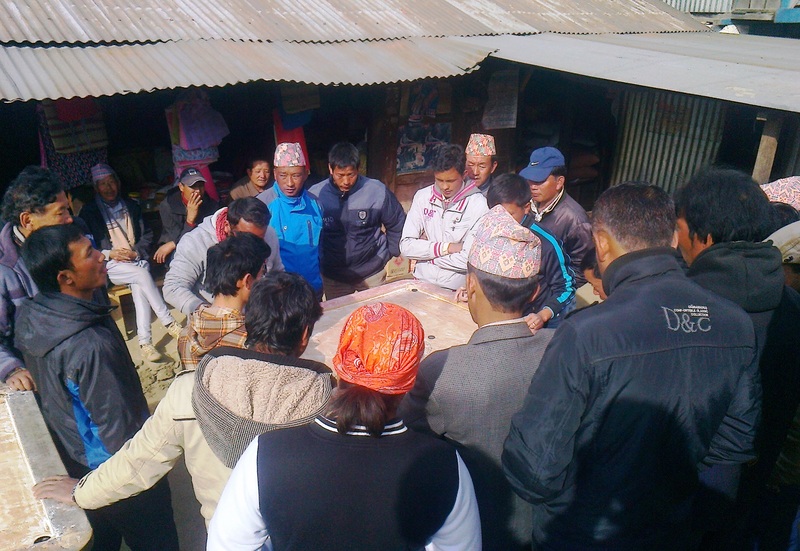 For developing countries like Nepal, it was recommended that a robust relationship between agencies interested and government of Nepal to encourage youth involvement in agriculture by supporting and promoting rural infrastructure and equal access to the use of ICTs among women and men is critical. Similarly, involvement of Public-Private Partnerships and investment of private banking sectors can brings these models into real in very short period of incubation. In fact, this will enhance youth involvement and can act as catalyst in agricultural development.